With the success of Cherenkov Astronomy and more recently with the launch of NASA’s Fermi mission, very-high-energy astrophysics has undergone a revolution in the last years. 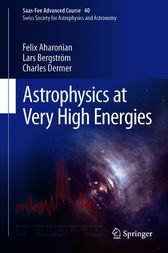 This book provides three comprehensive and up-to-date reviews of the recent advances in gamma-ray astrophysics and of multi-messenger astronomy. Felix Aharonian and Charles Dermer address our current knowledge on the sources of GeV and TeV photons, gleaned from the precise measurements made by the new instrumentation. Lars Bergström presents the challenges and prospects of astro-particle physics with a particular emphasis on the detection of dark matter candidates. The topics covered by the 40th Saas-Fee Course present the capabilities of current instrumentation and the physics at play in sources of very-high-energy radiation to students and researchers alike. This book will encourage and prepare readers for using space and ground-based gamma-ray observatories, as well as neutrino and other multi-messenger detectors. Max-Planck-Institut für Kernphysik, Heidelberg, Germany. He is Member of several high-energy astrophysics collaborations and working groups. Lars Bergström is professor in theoretical physics in the Department of Physics, Stockholm University, Sweden. Together with Ariel Goobar he is author of the successful book Cosmology and Particle Astrophysics. Dr. Charles Dermer is a researcher in the HIGH ENERGY SPACE RADIATIONS department of the U.S. Naval Research Laboratory, Washington, DC, USA. He is co-author of the book High Energy Radiation from Black Holes, by Charles D. Dermer and Govind Menon.